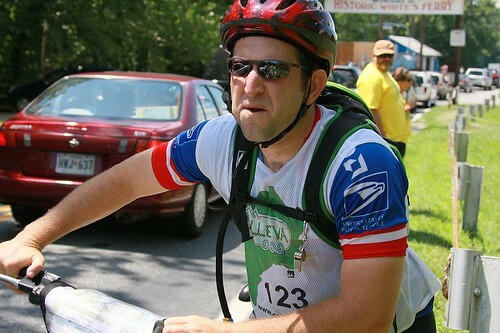 Imagine biking through the woods to find a checkpoint marked on your topographic map. Your partner is using the compass to find West while you’re busy scouting the terrain for the creek marked on the map. 100 yards ahead you spot it, a small white and orange kite propped against a tree. Adventure racing can best be described as a competitive scavenger hunt for adults. Split into multiple disciplines, the race involves locating checkpoints marked out on the course. You may be required to obtain some of the check points on bike, others on foot, still other by boat or better yet rappelling. 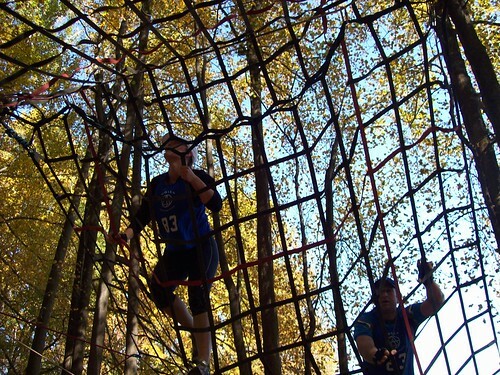 There may be certain challenges you have to complete along the way, possibly logic games, an obstacle course or even a rock wall or fireman’s carry. Your equipment generally includes a compass, food and water. Beyond that it’s your own wit and skill to guide you to the checkpoints. And it’s fun. Ridiculous, I haven’t had so much fun since I was 12 riding my bike to the lake fun. Adventure racing as a sport is growing at an incredible rate. More cyclists, triathletes and runners enter the sport each year, looking for a new challenge. Adventure racing takes skill and endurance. The short sprint distance races may range anywhere from 4-6 hours while longer races may last many days and cover expansive territory. Adventure racing camps will teach you the basic skills if you’re looking to do a longer race, but for those of us who are more of the “weekend warrior” type, here’s what you need to know. We’ll cover choosing gear in an upcoming post. Teams are usually 2-4 people depending on the company that is putting on the adventure race. They’ll likely have several divisions, mens, coed and possibly womens. Choose your partner(s) wisely, you’ll want people that not only have skills to supplement your weaknesses, but also people you can work with and trust. Nothing takes the fun out of something faster than having the wrong teammates. You can almost guarantee that every adventure race is going to at least have an orienteering and mountain bike component. Orienteering is the on-foot section of the course (here’s where you get to run around the woods with a map and compass). Generally you should be prepared to cross terrain without a path, with only your compass and topographic map to guide you. The mountain bike section will likely be limited to trails, but we’ve been at some races where we’ve had to hike our bikes up and over the hill, so read your map carefully. 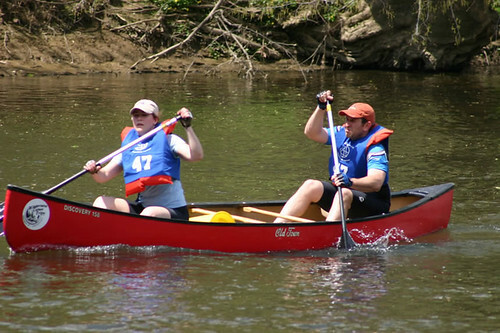 Frequently there is also a paddling section, usually canoeing or kayaking. This section usually isn’t that technical, but it will save you a lot of aggravation on the water if you paddle a few times with your teammates before the actual event. Orienteering. You should be comfortable using a compass before the event and comfortable reading a topographic map. Neither is difficult to use, but you’d be surprised how many people have difficulty with a compass once they’re lost. 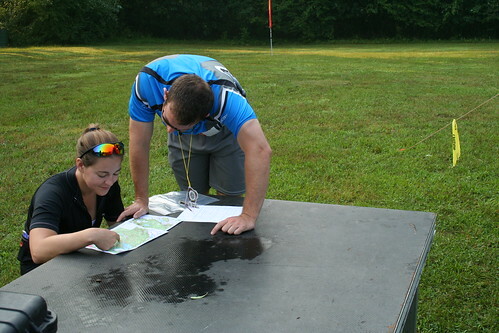 Make sure everyone on your team understands how to use a topographic map and understands the legend. Mountain Biking. You should be comfortable riding a mountain bike and have the endurance to complete the biking portion. Sprint races will often give you an estimate on the distance for the mountain bike section- make sure you can complete it. Endurance. This is probably the most important skill you need to have. And yes, endurance is a skill – you have to understand how to pace yourself and how to maintain your energy levels. Even a four hour race requires pacing and endurance, so if you’ve never completed endurance event before, think about what you’ve used in the past to get you through a long run or ride. We’ll get more into the endurance and gear aspects of Adventure Racing in the next few weeks. Check out the US Adventure Racing Association for more information on the sport and check out events in your area! Vienna is probably best known for its high culture: theater, opera, classical music, dance and museums. The center of the Austro-Hungarian empire for hundreds of years, we weren’t actually interested in seeing the cultural side of Vienna. Perhaps we’ve been in the “bush” too long, but I couldn’t really picture going to the opera in my chaco’s and convertible safari pants. Maybe that’s just me.Lucky for us there is a lot more to Vienna than it’s high culture. Vienna is called a “green” city, and when you look at the map it’s not hard to figure out why. Our first day in Vienna we took a hiking trail, accessible by public transportation, which wound through mountains and into vineyards. Seriously. No more than an hour after leaving the city we were in the middle of the woods atop a mountain overlooking Vienna. Climbing Kahlenberg-Leopoldsburg wasn’t a technical hike, the steep trail was paved most of the way, but the views were spectacular and we had to remind ourselves we were in one the largest cities in Europe. We picnicked in a vineyard and watched deer steal a few grapes for themselves. Not satisfied with a hike through the vineyards, we convinced our couchsurfing host to come to hike in the “viennese alps” with us. Hiking through alpine meadows up Schneeberg (snowmountain) was the highlight of our trip to Vienna. Especially when we saw the snow at the top. Let’s just say our African wardrobe was rather inadequate. Fortunately the alps are dotted with rest huts, which serve beer, schnapps, and even food. We did get in a little musical culture while in Vienna. The Danube Island Festival, a huge annual 3 day concert with over 2000 artists, the Viennese really know how to throw a festival. It’s the largest outdoor festival in Europe. Crowds of people, from teenage punks to toddlers and grandparents roamed the island moving from stage to stage listening, dancing and rocking-out to the music. On one of the stages, we caught a German 1950’s rock and roll cover band, complete with hair gel and combs. Like Elvis the front guy doo-wopped across the stage, while his bassist and guitarist performed acrobatics with their instruments. It was like back to the future when Marty rocks the under the sea dance. Not exactly Mozart.